As LG gears up to... confuse us again with the simultaneous announcement of the G8 ThinQ and V50 ThinQ 5G, one of the best smartphones of 2018 that very few people actually purchased is on sale for a limited time. While we can certainly understand why you’d avoid the LG V40 ThinQ at a list price of around $950, Best Buy is practically paying you to get this powerhouse between today and Sunday, February 10. Technically, new Sprint subscribers and those looking to add a service line to an existing account will still be charged $15 a month for 18 months with a Flex Lease agreement or $15 a month for two years with regular installment plans. That amounts to $270 and $360 respectively (after $20 or $15 monthly bill credits), which is already an incredibly small price to pay for a high-end 6.4-inch handset with a grand total of five cameras in tow. But the deal gets a lot better, as LG also promises to hook you up with a free 49-inch 4K TV. Separately, that’s worth a whopping 500 bucks, covering the marked-down price of the V40 ThinQ... and then some. In order to redeem your crazy expensive gift, you need to register on a special webpage after making your purchase at Best Buy. 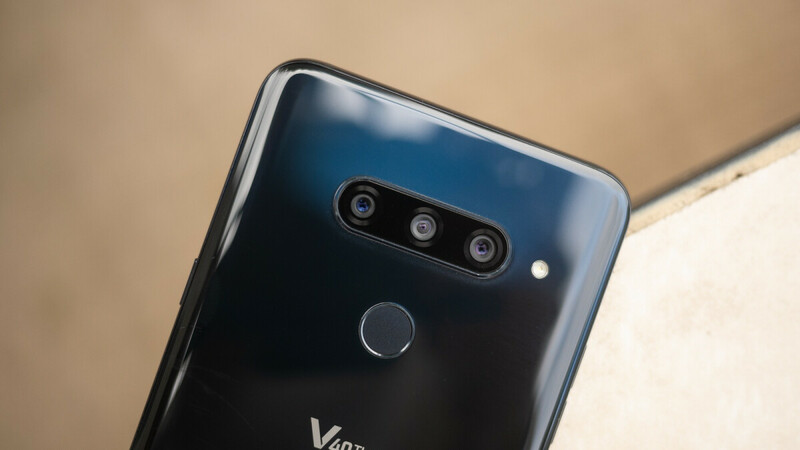 You only have until February 21 to do so, and you can even qualify if you pay for your Sprint-locked LG V40 ThinQ upfront, although that means spending at least $720 right now. The same exact freebie was offered for a little while directly through Sprint back during the Black Friday frenzy, but now the phone is also significantly cheaper with a lease or device payment plan. Available in Aurora Black only, the V40 ThinQ is a notched giant with a sharp OLED screen, premium build quality, state-of-the-art Snapdragon 845 processor, 6GB RAM, 64GB internal storage space, three versatile rear-facing shooters, 8 + 5MP dual selfie cameras, and a somewhat underwhelming 3,300 mAh battery. But a couple of small flaws are certainly not to be considered deal breakers. Sure LG will not hire you.... but i still wish you work a store near me andgive me that’s deal. I doubt it. I don't think there's a massive demand for LG phones for that to happen. And LG. They aren't exactly what I would consider reliable. I wish Samsung would bring back the Galaxy deal. The 50” 4K Samsung deal. TMO amd AT&T had it going. Samsung has a lot of deals, but I don't think they're as desperate as LG is to get rid of unsold units. Post the link that proves LG is desperate to get rid of unsold units. I'd like to read it. The article is proof enough. Not like you would have cared either way. Yeah LG is quickly becoming a bargain brand although their TVs are still good. I love my 55" webOS TV. +1 for the Essential, a criminally underrated phone that deserves better. LG makes some great products. I own 2 LG TV's. Nothing bargain about the brand at all. I just recently purchased an LG V35, and it's an extremely underrated smartphone. Performance is great. Is there any reason why you are getting so defensive about LG? Hi everyone 2 years ago I never got into LG one day I heard good thing about it I went out and bought new lg 50 inch TV at the time 4K models where too expensive at the time. Working like a champ no issues at all and nice and clear picture for 1080p tv. I know not tv article sharing my experience with LG. Yeah their TVs are great. I love mine. I understand that some people are so defensive about it, but I don't think there's anything wrong with their TVs. Their TV's are amazing. I own two of them. I don't understand why some people have taken to talking down about LG. They make some great products.